Thursday February 7, 2019 - President Uhuru Kenyatta has revealed that leaders from the Democratic Republic of Congo (DRC) will henceforth start classes here in Kenya. Speaking after hosting DRC President, Felix Tshisekedi, Uhuru indicated that his Government will partner with Congo in capacity building. "We will offer training opportunities to Congolese public servants in Kenya’s training institutions such as the Kenya School of Government," Uhuru stated. The Head of State equally lauded the citizens of Congo for their maturity in conducting the last election and urged them to unite and develop their country. 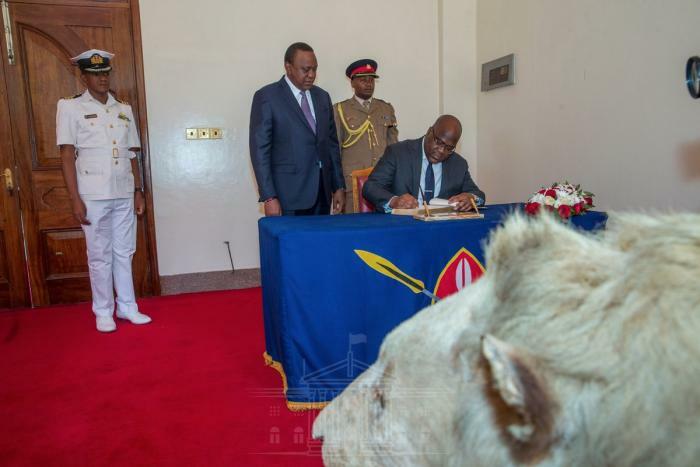 "Kenya has learned valuable lessons from past political tensions, which the country is willing to share with the Great Lakes nation," Uhuru stated. Earlier on, Tshisekedi held talks with African Union (AU) High Representative For Infrastructure Development, Raila Odinga‏. "The talks focused on areas of mutual interest and cooperation with a particular emphasis on the role of infrastructure in development on the continent," Raila indicated.